Mount Mercy College is a secondary school based in Bishopstown, Co. Cork. It has 810 students and 55 teaching staff. 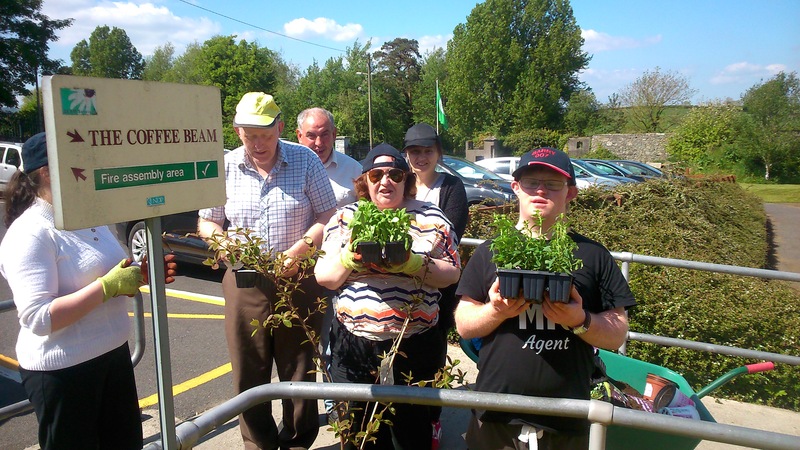 They were awarded their Green Flag for Biodiversity in May 2017. Every September the Green-Schools Committee is selected based on a nomination process. Students who have shown dedication and commitment in previous years are nominated by both teachers and students. The Committee is made up of 11 students, with a joint chair and joint secretaries. There are representatives from both the junior and senior cycle on the committee, which also includes six members of the teaching staff. They meet every fortnight. Revisited previous themes (i.e. Litter & Waste, Energy, Water, and Travel) to identify links between them and the Biodiversity theme. The Committee did further work for the Environmental Review, in order to develop a clear picture of what was really needed on their grounds to help promote biodiversity. After the surveys had taken place it was discovered that the students had very little experience of gardening at home. 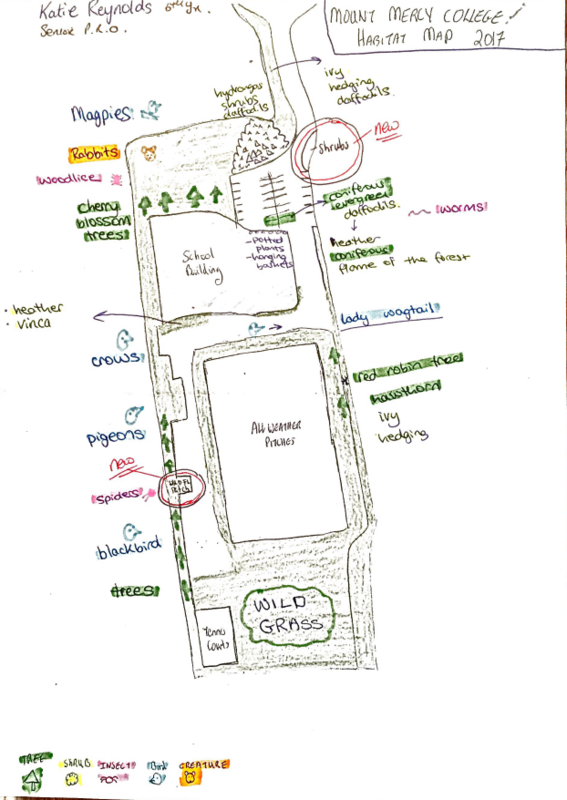 The first habitat map (see Image 1 below) showed that there were little to no wild flower habitats on the school grounds. 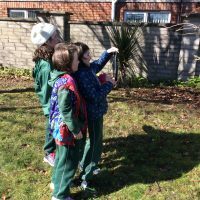 It was further noted that both students and teachers had little knowledge of Ireland’s plant and animal species and what they might be able to bring into the school grounds with some changes. Finally it was noted that some pupils were not segregating their rubbish properly and still put waste into the wrong bins. With all of this in mind the Committee set out to change the school for the better and promote high levels of biodiversity. Raised awareness on Biodiversity with the Committee. Teacher awareness raised in staff bulletin. Held a poster competition for 1st year students. Set up an Instagram page. Updated the Green-Schools notice board. Planted a new flower bed in the front of the school. Inserted hanging baskets and potted flowers around the school grounds. Constructed two bug hotels and 1 log pile. Developed a wildlife garden by leaving an area unmanaged. Developed a native wildflower patch at the back of the school to promote pollinators. Developed new signs so that students could dispose of waste in the correct bins. 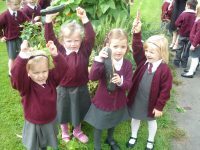 Insects and bugs: bees, butterflies, woodlice, slugs, earthworms, ladybirds and snails. 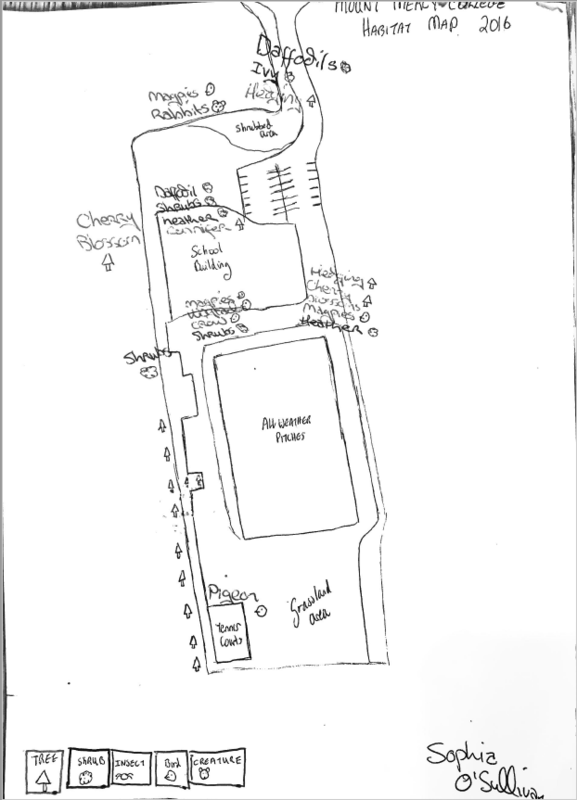 Image 2: Mount Mercy College Habitat Map 2 (after action was taken) – essential for The Monitoring and Evaluation step. New signs erected to ensure waste is put into he correct bin. Intercom announcements to remind students and staff to tidy classrooms at the end of the day. Both recycling and black bins moved out of classroom and into corridor so students will have to consider more carefully what goes into each bin. Intercom announcements to remind students and staff to turn off lights and close windows at the end of the day. Energy posters are displayed around the school. Staff bulletin contains reminders for staff to be vigilant in conserving energy. Ensuring projectors and laptops are all switched off when not in use. Water posters are displayed around the school. Home Economics clean up is done in a basin instead of under a running tap. WOW days are encouraged in good weather. Parents are discouraged from parking near the school. Science (Junior) Plant and animal life. Parts of the flower, plant reproduction, pollination and seed dispersal. Biology (Senior) Ecology – habitats, conservation, inter-relationships, adaptation and survival. Ecology field trip to Fota Wildlife Park. Environmental Studies (TY) Presentation to junior classes to raise awareness of biodiversity. 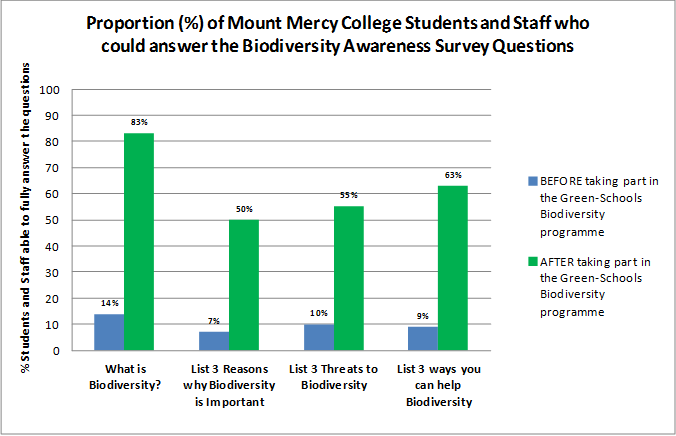 CSPE (Junior) Biodiversity Awareness Survey 2: analysing the results. 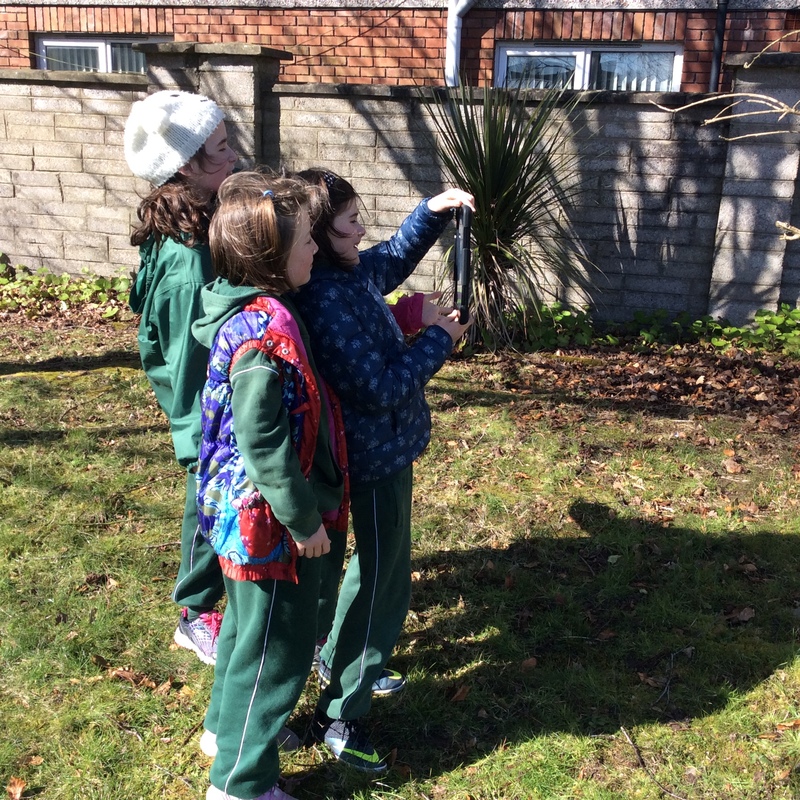 Identifying flora and fauna of Fota wildlife Park. Encouraging media awareness of topical environmental issues such as the problem of invasive species using Japanese Knotweed as a case study. Home Economics Planting herbs such as basil and parsley to develop gardening techniques among students. Geography (Junior and Senior) Map reading. Active teaching of the staff members. Announcements made over the intercom. 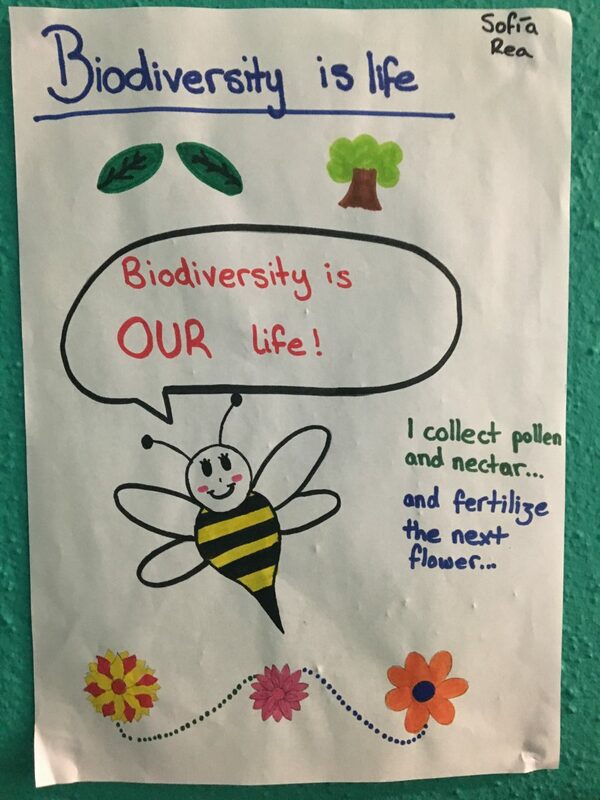 During the schools Biodiversity Awareness Week (13th-17th February), daily Biodiversity Facts were communicated to the school community by each member of the Green-Schools Committee. Staff are informed about biodiversity based activities through the weekly staff bulletin. Keeping the Green-Schools notice-board up-to-date. Emails were sent out to parents informing them of school activities. A school bog provides comprehensive updates on the Green-Schools progress. A Green-Schools Instagram page was set up and is used to keep the local community informed. Biodiversity is Mount Mercys Way, so we don’t let nature go astray. Increased awareness regarding importance of plant and animal life and their role in sustaining all life on Earth. It highlights the vital role humans play in creating a sustainable planet. We found that everyone was interested in this flag in particular as they saw that they could easily make a big difference to our environment. 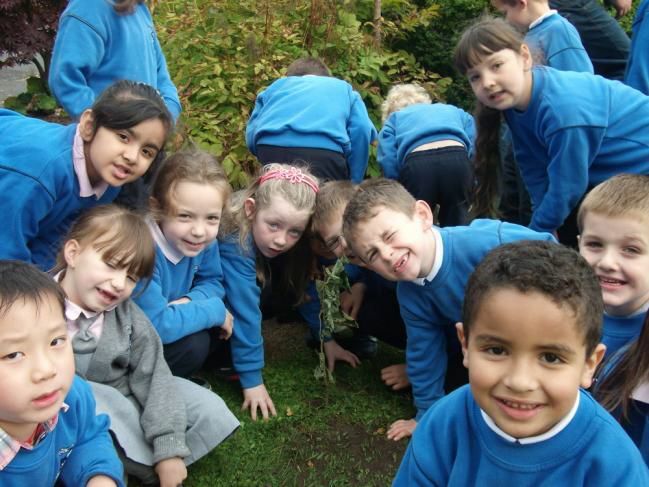 The link with nature proved very popular among all those involved. The Green-Schools website contains many useful resources. Also contact with Green-Schools representatives is useful for advice and encouragement.